MUMM-RA creates a museum whose paintings and statues come alive as the ThunderCats’ more formidable foes. As Lion-O and SNARF prospect for Thundrillium, MUMM-RA turns into DR. DOMETONE and lures LION-0 to the deadly museum. SNARF fails to stop MUMM-RA and rushes back to the Lair for help. Inside the museum, a painting of SAFARI JOE comes alive and ambushes LION-0. LION-0 defeats SAFARI JOE only to face RATAR-O, who jumps out of a painting and attacks. RATAR-0 traps LION-0 in the electrical force of his Electro Sais, but LION-0 breaks free. MUMM-RA appears and douses LION-0 with Warp Gas. The gas makes LION-0 too scared to fight, so he runs. Meanwhile, the other THUNDERCATS set out in the ThunderTank to rescue LION-0. Once within MUMM-RA’s museum, they decide LION-0 must be inside one of the paintings. WILYKAT and WILYKIT enter the SAFARI JOE painting. The other THUNDERCATS drive the ThunderTank into a painting of SPIDERA, who traps the ThunderTank in her webs. SAFARI JOE captures the THUNDERKITTENS in sacks. 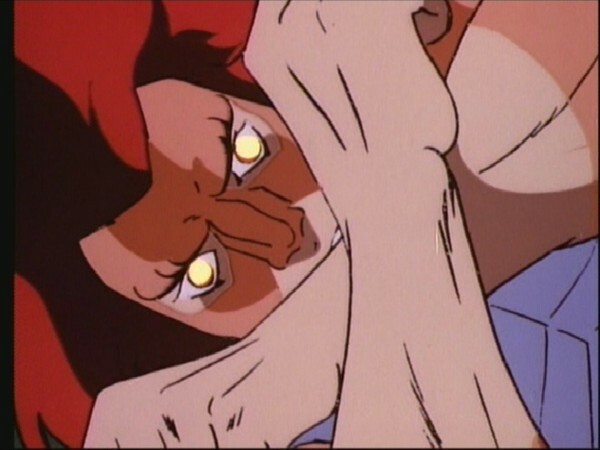 LION-0 revives to confront MUMM-RA, who transforms into a duplicate of LION-0. LION-0 defeats his own duplicate. 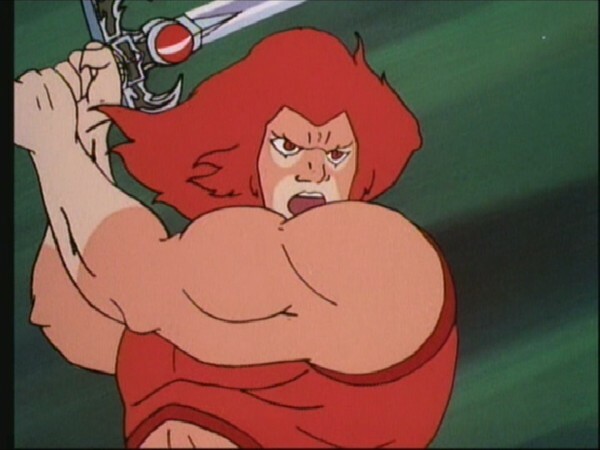 Then he uses the Sword to free the other THUNDERCATS from the evil paintings. 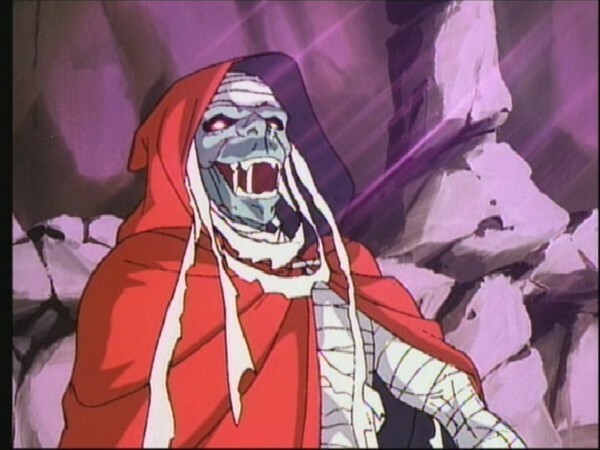 Mumm-Ra, lures Lion-O into a trap in the guise of Dr. Dometone, who convinces Lion-O that the residents of Third Earth have erected a cave museum in the ThunderCats’ honor. Once inside, however, Lion-0 is confronted by many of the evildoers he faced in the past when paintings of them come alive. Valiantly he holds off them and Mumm-Ra, one by one, until he is made vulnerable by warp gas. The ThunderCats arrive to help him and they each take on a villain. Lion-O recovers from the warp gas to fight Mumm-Ra, who has taken on Lion-O’s likeness as a statue. 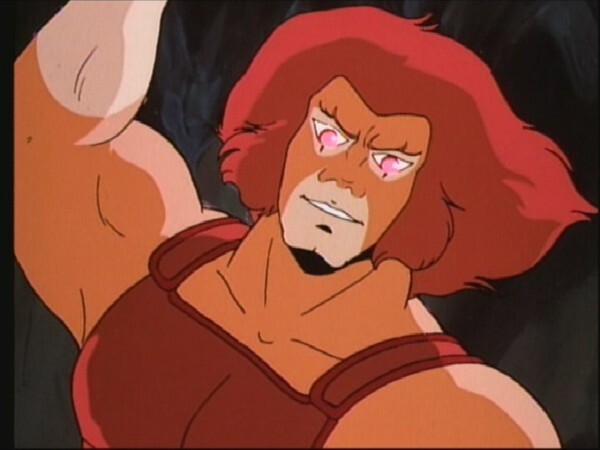 Lion-O defeats him and calls on the Sword of Omens to call the ThudderCats back from their battles. 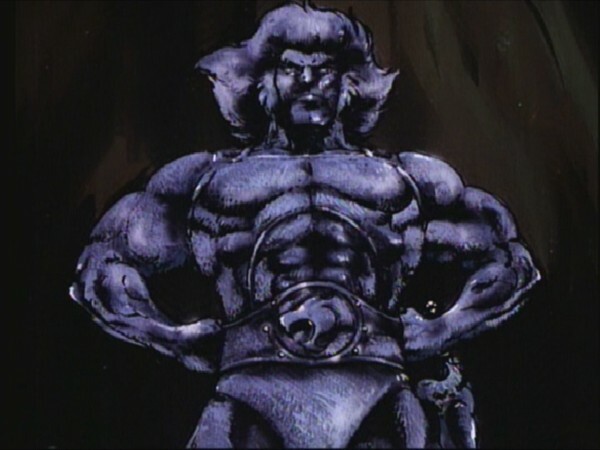 The episode recounts many of the variants of evil Lion-O and the ThunderCats have faced during their stay on Third Earth. Once again they emerge victorious in the confrontations. Lion-0 is given a reminder by falling for the trap set by Mumm-Ra that the deeds of ThunderCats are not done for conceit or vanity. Rather, their actions and their lives are destined for serving as faithful adherents to the Code of Thundera. 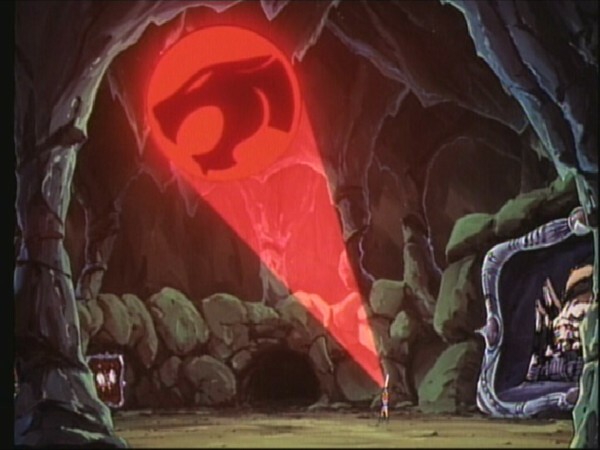 As ThunderCats they are called upon to live for truth, justice, honor, and loyalty. It is a code, which no evil can overcome because it is based in good. And in remaining loyal to it the ThunderCats serve as role models for us, who in our lives are also called upon to live morally. In any work of fiction, the hero is defined by the villain. Without a dastardly nemesis to battle, there would be no protagonist. Just as without light, there would be no shadow. The arrival of a sinister character necessitates the existence of the good guy. Despite being complete opposites and constantly warring with each other, the hero and villain are mutually dependent. And for such good versus evil battles to be successful, the villain has to be a dangerous threat to the hero. Only then will the eventual victory of the champion be exciting, and greeted with applause from the audience. 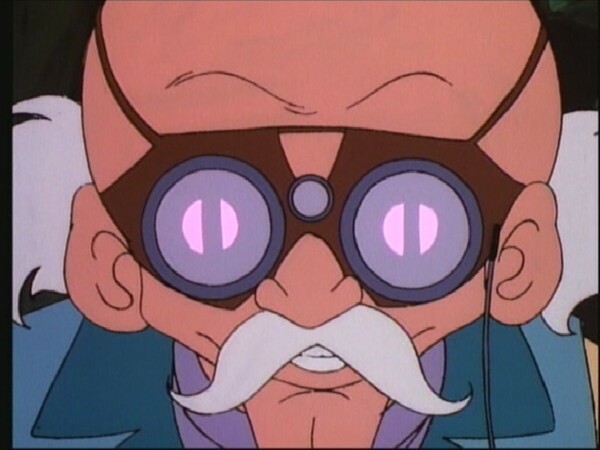 There are a plethora of evil characters in the ThunderCats mythos with some having come very close to vanquishing the feline heroes. Thus it is always exciting to see these powerful adversaries get a second shot, which exactly is what “Fond Memories” offers them. 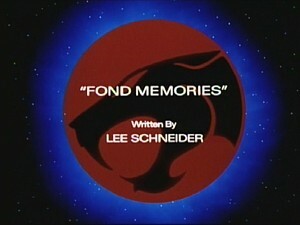 Written by Lee Schneider, “Fond Memories” begins with Mumm-Ra hatching yet another plot to exterminate the ThunderCats. Credit has to be given to the devil priest for his perseverance and for the ingenious schemes that he devises to attack the ThunderCats’ various weaknesses. In this episode, Mumm-Ra targets Lion-O’s vanity by luring him into a trap camouflaged as a tribute. Summoning four of the ThunderCats’ most formidable opponents, Mumm-Ra creates an artificial living museum featuring these villains. He then transforms himself into Dr. Dometone, and the disguised Mumm-Ra escorts Lion-O into the museum where the young lord is astonished to see giant paintings of S-S-Slithe, Safari Joe, Spidera and Ratar-O. Suddenly, one-by-one each of his enemies comes to life and attacks Lion-O. The battle sequences between Lion-O and the villains is very well written and animated. Despite having defeated them during previous encounters, Lion-O has a tough time dispatching them here. Mumm-Ra using the Warp Gas to turn the mighty Lion-O into a timid kitten is a nice touch. 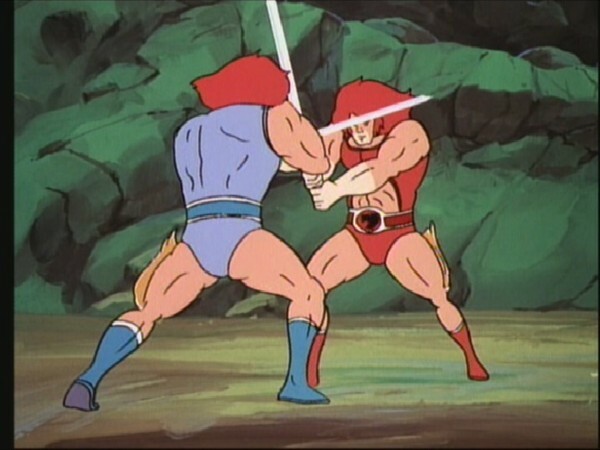 However, the highlight of the episode is the climactic battle between the good and evil Lion-O’s. Mumm-Ra reveals his ace in the hole when he transforms himself into a red-clothed clone of Lion-O and leaps into battle with the real ThunderCat. The electrifying fight sets the screen ablaze with action as Lion-O’s every move matched by his evil twin. This scene echoes the fight between the good and evil Superman in “Superman III”. 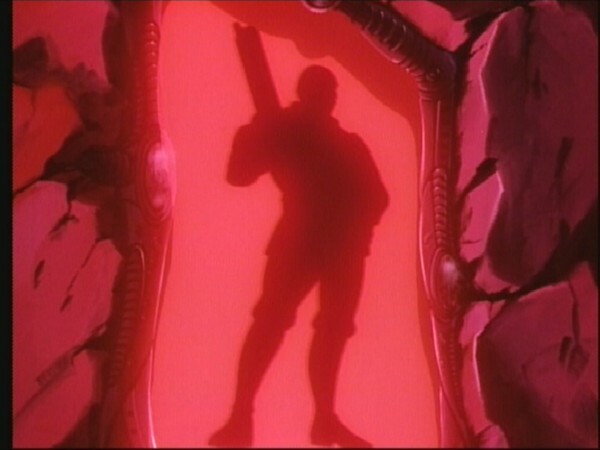 Only a hint from Jaga gives Lion-O the idea to defeat Mumm-Ra by showing him his reflection. It’s rather peculiar that Lion-O could not think of this himself given the fact that he has defeated Mumm-Ra innumerable times this way! The quality of animation and the background paintings present in “Fond Memories” are splendid despite a few reused sequences from previous episodes. In some ways, “Fond Memories” is analogous to “Mechanical Plague” as the premise of both centers on Mumm-Ra summoning past villains to defeat the ThunderCats. But what gives this episode the edge is pitting all the adversaries against Lion-O alone instead of having them engage in a one-on-one battle with all the ThunderCats. Despite being a largely action oriented episode, “Fond Memories” is not just an assembly of mindless fight scenes, and the compact yet entertaining script makes this a must-see installment. There are a number of sequences which recycle animation from previous episodes. The battle between the ThunderTank and Spidera is taken from “Queen of 8 Legs”, and the entire scene of the ThunderKittens being caught by Safari Joe is from the episode “Safari Joe”. 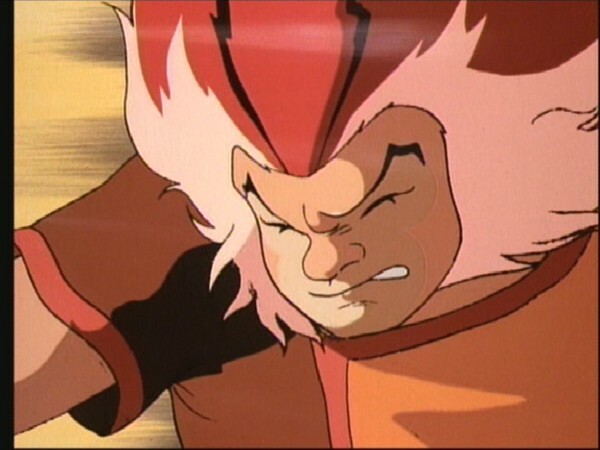 The Evil (Red) Lion-O featured in this episode was released as an action figure by Bandai at the Singapore Toy, Game and Comic Convention (STGCC) in 2012. Much of Safari Joe’s dialogue is the same as what he said in his eponymous episode.